Osteogenesis imperfecta (OI) is a genetic disorder in which bones break easily. Sometimes the bones break for no known reason. OI can also cause weak muscles, brittle teeth, a curved spine, and hearing loss. OI is caused by one of several genes that aren't working properly. When these genes don't work, it affects how you make collagen, a protein that helps make bones strong. OI can range from mild to severe, and symptoms vary from person to person. 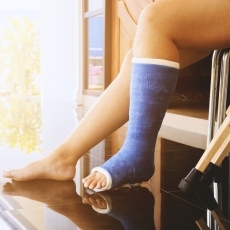 A person may have just a few or as many as several hundred fractures in a lifetime. No single test can identify OI. Your doctor uses your medical and family history, physical exam, and imaging and lab tests to diagnose it. Your doctor may also test your collagen (from skin) or genes (from blood). There is no cure, but you can manage symptoms. Treatments include exercise, pain medicine, physical therapy, wheelchairs, braces, and surgery. Article: Osteogenesis Imperfecta: A Pediatric Orthopedic Perspective. Article: WNT1-associated osteogenesis imperfecta with atrophic frontal lobes and arachnoid cysts.